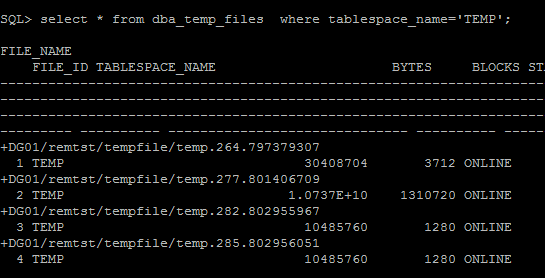 This blog is intended to make DBA’s aware of what havoc it will create if we misplace a command of datafile addition in ASM disk group especially in RAC. But it is not possible to offline TEMP tablespace. To avoid this issue in future, we have to make use of below commands while adding temp/datafile in ASM environment. Being OMF, ASM has predefined template for each type of tablespace & it is not required to pass disk group location or absolute path while adding a tablespace or data/tempfile in it.